Last weekend, I kicked off my summer vacation by spending Friday-Sunday at dare2tri’s second annual Paratriathlon training camp. 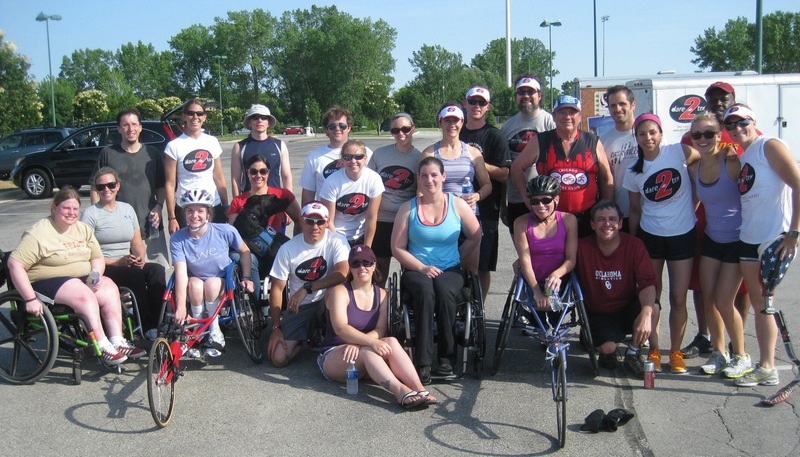 Just to remind you, dare2tri is a Paratriathlon club that was founded in Chicago last year, and the thing that basically got me started in the sport. The weekend-camp is just one of many triathlon training opportunities that dare2tri provides for athletes with physical disabilities and visual impairments. All of the weekend’s activities took place just north of the Wisconsin-Illinois border at the Pleasant Prairie RecPlex, an awesome facility with a beautiful 50-meter pool and a cute little lake surrounded by biking and running paths. It was intense two days of training that culminated with a mini sprint triathlon on the third day of camp. On both Friday and Saturday, all of us athletes were paired with a volunteer and divided into two groups: wheelchair and ambulatory. From there, we spent the days rotating between 1.5-hour training sessions dedicated to the major aspects of triathlon—swimming, biking, running, and transition. All of the sessions were led by experienced coaches who taught us skills and drills in all of the disciplines. 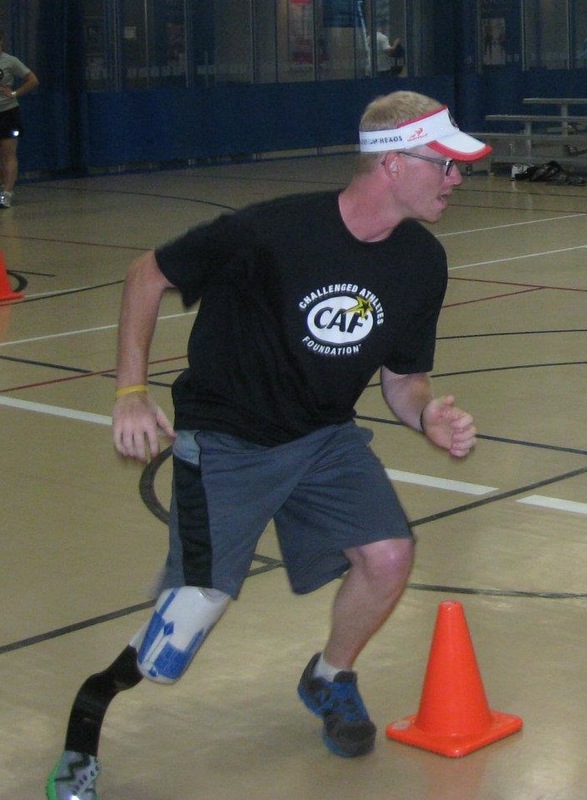 We even had some Paralympians attend as coaches, which really brought the camp to the next level. The swim workouts were led by three-time Paralympic swimmer, Jason Wening. We worked both in the pool and in open water, and Jason gave me some great tips for improving my stroke. By the end of the session, I noticed a significant difference in how I was swimming. The cycling workouts were also great, with Stacee leading us through bike handling techniques and speed work. I logged many loops on the RecPlex’s bike path, which Stacee strategically rigged with sprint intervals into the headwinds. Dare2tri coach Dan Tun (not to be confused with musical composer Tan Dun) co-led the ambulatory running session. He was joined by Sandy Dukat, a fellow above-knee amputee and one of my mentors, who flew in from Colorado just for the camp. Sandy spent most of her athletic career as a ski racer, but started doing triathlons as a form of cross-training, and ended up winning a few national championships and setting some world records in the process. I met Sandy on a ski trip in Steamboat earlier this year, and ever since then she has been a huge supporter of me, always there to give me advice and encouragement. Getting the chance to train with this incredible athlete was truly an honor, and she and Dan gave me lots of tips and exercises to improve my running. Sandy was great at motivating me to excel over the weekend, but she also gave me motivation to carry into my training after camp. In a speech that she gave at Saturday night’s dinner, she talked about how she approaches every day as if there’s a gold medal on the line—how she wakes up every morning and formulates a plan of how she will make that day a day to remember. As I listened to her speak, I realized that what she was describing was the attitude of a true champion. In that moment, I made a promise to myself that I would approach my athletic dreams in the same way, and that every morning I will make a decision to push myself closer to my goal than I was the day before. Ten years from now, I doubt that I will remember all of the workouts that we did at this weekend’s camp; but I will never forget that piece of advice, as I plan to put it into practice every day from here on out. The coolest part of camp was the was seeing the determination and persistence in all of my teammates: a sight that made me work harder myself. It was a stifling hot weekend, and there were certainly times when all we wanted to do was call it quits. But nobody ever cut the workout short, and we all pushed each other to do one last lap, or give it “2% more” when we were already all-out sprinting. Our competitive spirits fed off of one another, and is what ultimately led us to take so much out of the weekend. By Sunday morning, everyone was suffering from severe sun exhaustion, muscle fatigue, and bad tan lines. But we all stepped up to the plate and put on our game faces for a mini-sprint triathlon. The race was the perfect way to conclude the camp, and allowed all of us to put the skills that we had learned to the test. For many of the camp athletes, this was the first triathlon they have ever done. It’s an amazing thing to see someone cross their first finish line. There are smiles, tears, hugs, shouts of joy, and a sense of pride that starts with the athlete and quickly spreads to all who are watching. It’s a feeling that can’t truly be described unless you experience it, but once you do have that first finish line moment, it makes everyone else’s feel so much sweeter. Sunday’s race was a solid one for me, but even more fun was celebrating as the remaining athletes pushed through the finish chute. After packing up all the equipment, we all celebrated the end of camp with a post-race BBQ. Fortunately nobody could tell with my sunglasses on, but I had tears in my eyes as I looked around at all of these people who were now official triathletes. I was so overwhelmed by everything that this club has become in one short year. In just over a year, dare2tri has established its name both amongst triathletes in Chicago and on the national level; it has gotten dozens of athletes to their first starting line and prepared them to reach their first finish line; it; and it has changed the lives of both athletes like myself, and the volunteers who support us. But most importantly it has built a community—a group of people that will do anything to support another athlete, and who constantly push one another to greatness. Yes, I’m inspired by watching dare2tri athletes do things that many able-bodied people would never attempt; but I think what inspires me more are the small acts of camaraderie that, together, create the sense that we are a family. I want to end with an awesome success story from camp. Everyone involved with dare2tri has a story about how they got started, but Justin’s has to be one of my favorites, just because it proves how one chance encounter can forever change the course of one’s life. Last year, on the Saturday of camp, Justin happened to be walking in the same parking lot as the executive director of Great Lakes Adaptive Sports Association (the organization I interned with last summer, and a partner of dare2tri). Like any good adaptive sports proponent, she saw Justin’s prosthetic leg from afar and chased him down to talk to him. She told him about the camp that was going on and the race that would be held the next day, and encouraged him to come and check it out. Fate worked out in such a way that he was able to stop by to watch the race and meet Dave the prosthetic genius. Justin told Dave about how he was a high school track athlete before he lost his leg to cancer, but has not been able to run since. When the race was over, Dave attached a running blade to his socket, and for the first time in ten years, Justin ran. This year, Justin returned to camp, this time for the full three days. He was a total star in all of the training sessions, reminding us all that while cancer can take a leg, it can’t conquer the spirit of an athlete. And on Sunday, he crossed the Pleasant Prairie finish line, thus joining the 1% of the world who can proudly call themselves triathletes. He didn’t have to tell me what he was feeling, as the smile on his face said it all: he was hooked. And this, my friends, is what it’s all about. I thought I could be the quiet sneaky reader of this fantastic blog. I find myself checking back here more often then there are posts posted! Anyways, I had to say thank you for the kind words. 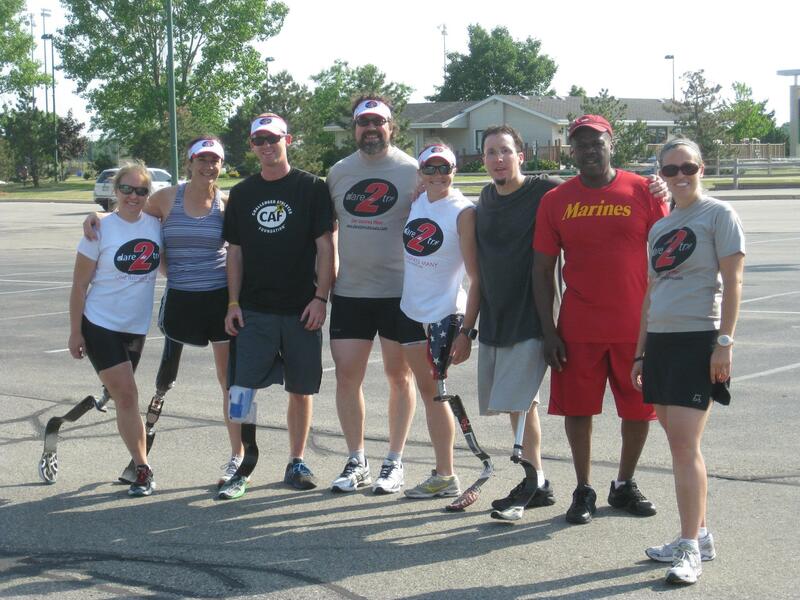 I am truly grateful for people like you, and all the coaches of Dare2Tri. It is very hard to put into words how awesome it feels to be an athlete again. Like you said, I just smile a lot! Keep up the good work and can’t wait to compete by your side in the next triathlon.